"Putin on Poroshenko -- for mature audiences only" -- the tone of public discourse in Russia has deteriorated noticeably since the president came to power. Some supporters of Russia's slain opposition leader Boris Nemtsov say that, in his 15 years in power, Vladimir Putin has systematically built a culture of hatred that has trained large swaths of the population to ignore, or even condone, violence. Here's how he did it. 1) Lower the tone of debate... Despite the Kremlin's recent crackdown on swearing, Putin has been peppering his rhetoric with vulgarities since the earliest days of his presidency, usually to connote emphatic distaste for a whole range of adversaries: Chechen militants, journalists, former Georgian President Mikheil Saakashvili, and lazy leaders from the Commonwealth of Independent States who "just chew snot from one year to the next." The effect of the resulting shock wave is twofold. On the one hand, it knocks the wind out of outsiders unused to this take on presidential discourse. On the other, it allows Russians like Vladimir Talismanov, a deputy dean at the Moscow Institute of Physics and Technology -- where Boris Nemtsov's son Anton is a student -- to feel that it is not only acceptable, but laudable, to publicly praise Nemtsov's assassination as leaving Russia with "one less scumbag" to worry about. At the same time, the Kremlin has adopted an increasingly unfriendly attitude towards national minorities, sexual minorities, and migrants, overlooking both xenophobic and homophobic attacks, and publishing pamphlets advising labor migrants to act "more Russian." The result? A disproportionately inflated but narrow sense of self, partnered with an irrational fear of anything "other." As one pundit wrote this week on a conservative website, "I'm Russian and I'm tired of apologizing for that!" 3) Expand accordingly. As we know, Putin ranks the dissolution of the Soviet Union high on the list of historical calamities. But that hasn't stopped him from seeking to rebuild a better Russia by assuming control of choice nearby territories, such as Crimea, and permanently weakening others by drumming up pro-Russian separatist sentiment --such as Abkhazia, South Ossetia, Transdniester, and Donbas. Last year's militarized annexation of Crimea, despite the huge financial costs it will ultimately demand, proved tremendously popular in Russia, where many people felt the act was righting a historical wrong -- and throwing down the gauntlet to neighboring Ukraine. 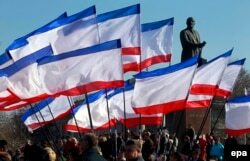 Pro-Russian demonstrators rally in Crimean capital, Simferopol, in February last year. 4) Target your enemies. The standard of living for the average Russian has unquestionably suffered in the past year, with the local economy crushed under the dual burdens of Western sanctions and falling oil prices. But, while the prospect of food shortages and price hikes might prompt some Russians to question their government's decision-making, the Kremlin has handily turned the bleak scenario at home into a fresh opportunity to vilify not only Ukraine -- the reason for the sanctions -- but also the countries that endorse them, in particular the United States. A convenient scapegoat, Washington has been blamed by Russians for everything from the Euromaidan protests and loose morals to the Charlie Hebdo attack and, most recently and perhaps most brazenly, Nemtsov's assassination. 5) No, really -- target your enemies. When you control all major media in your country -- including the all-powerful airwaves -- it is easy to educate the population on what they should fear. For the past year, Russian media has stood by faithfully and Putin's language has grown more extremist in tone -- warning not only of outside threats but those at home. Russians who opposed the Crimean annexation were "national traitors and a fifth column." Members of the Anti-Maidan nationalist movement decried the country's tiny liberal clan as members of a "fascist junta." Street signs and banners were hung from prominent city buildings showing portraits of Nemtsov, activist Aleksei Navalny, musician Aleksandr Makarevich, and others, and identifying them openly as traitors. "When they started displaying pictures of Boris and other prominent oppositionists around the city and on TV," says Garry Kasparov, "it was an invitation to execute them." "The Kremlin is cultivating and rewarding the lowest instincts in people, provoking hatred and fighting," Nemtsov wrote on Facebooks just days before his killing. "People are set off against each other. This hell cannot end peacefully."